KML writer Elaine Gavin and a young writer. Photo by James Jordan Pictures. We are thrilled to offer our first Youth Comedy Writing Classes open to the general public in 2019! Through a new partnership with The Children’s Creativity Museum, Killing My Lobster sketch comedy writers and instructors will host 90 minute after-school writing workshops for children ages 8-11. The once weekly workshops will culminate in a final read with professional KML actors to which parents and friends are invited. We’ll get the kids’ creative brains working, help them understand how to write original characters, and how to give their sketches a beginning, middle, and end. We’ll help them express their ideas and stories and show them how they can be brought to life by performers. 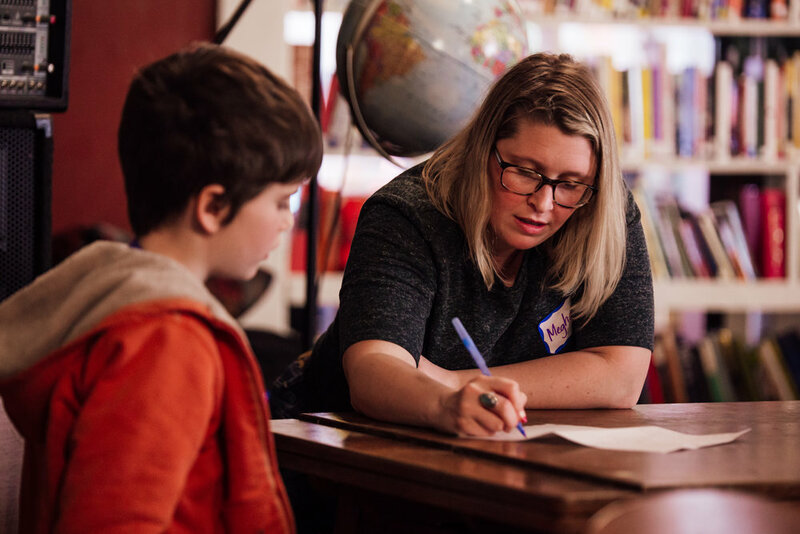 Whether your child is looking for something fun to do after school, or has expressed specific interests in writing and/or comedy, we’re here to help them unlock their creativity, in a safe, supportive environment with instructors who have years of experience working with youth in a creative education setting. KML cannot issue refunds for classes, but we do allow you to transfer course credit. If you need to transfer course credit to another class, KML can apply your credit to another class within 6 months of the dropped class. In order for course credit to be reapplied you must notify KML at least 7 days prior to the first day of the class for which you originally signed up. If a student misses two or more classes, they are automatically dropped from that session. The student is welcome to enroll in future classes, but their enrollment in the previous session will not rollover into the next session and the student will be expected to pay for the new session in full. All students are expected to attend the final class read. Meghann Hayes and a young writer at 826 Valencia. Photo by James Jordan Pictures. Meghann is an educator and comedian out of San Francisco. She is in her 10th year of teaching and 7th year with SFUSD. She has been with Killing My Lobster for 7 years and has had the pleasure of writing, acting and teaching kids comedy with the company. Teaching kids sketch comedy is a perfect marriage of her love of comedy and teaching children. She has been lucky enough to be one of the co-founding teachers of the 826 Valencia Project with Killing My Lobster. KML and 826 have created amazing shows and showcases based on the work of children. One such showcase ended with a bus exploding and even the surliest of adult comedy writers in the audience were crying with laughter. She is so excited to continue this work! Sam is a comedian and educator from the Bay Area. Sam has helped found and educate with an after school program, Feelosophers Path, focused on supporting kids with emotional intelligence needs since 2012. 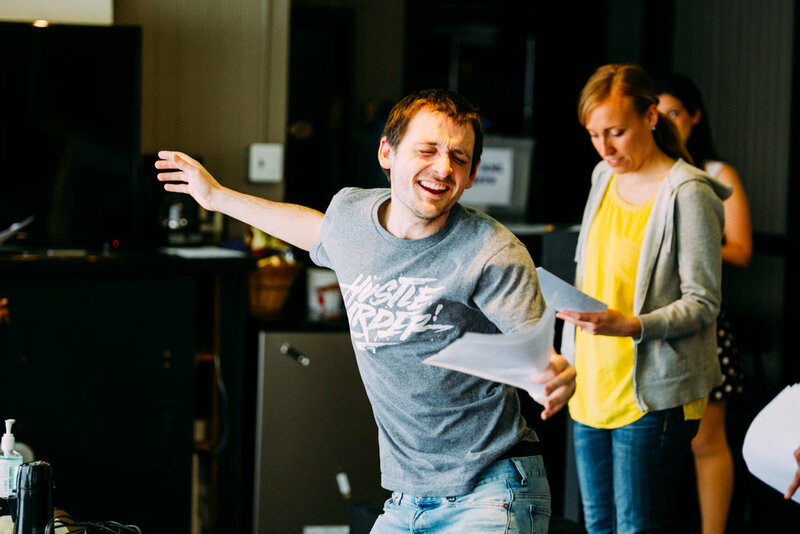 Sam has written and acted for many Killing My Lobster productions since joining the creative team in 2015, and he is thrilled at the opportunity to help students explore and grow confident in expressing their comedic voices. As an educator, Sam believes that creating a learning environment of respect, support and positivity is necessary to helping students realize their full potential. He is looking forward to working with students at the Children’s Creativity Museum and sharing their ingenious jokes and stories with local audiences!